I made templates of my trim pieces out of teak and varnished 5 coats. Yeah, I'm a glutton for punishment. Took mine off and had replicated with a white plastic, not quite Starboard. The cut all the pieces to size and rounded the sides off for me. Used a thick Starboard for the bottom rails of my 94 seafarer. Putting it on in a few weeks and will have better photos then. Here is a photo of the pile in my office and a piece of the old trim. Little dusty but I think it will look great. Nothing worked on my trim so I actually used a wood grain decal and it actually looked great. I am thinking it was made by 3M. Mine post painting with Pettit Jade Green topsides paint. They look pretty good for my personal painting ability. There are some fuzzes but, they're 1000% better than what was there. If you sand off the phoney wood decal, what's underneath? Ok....got sick and tried of looking at the faded, sunburned duratrim. Seemed like finding a suitable product to replace it was going to be difficult. I like what a lot of you guys did, so decided to take it all off. I sanded off the ugly wood grain to see what was underneath...hmmm...interesting. This stuff reminds me of layered Formica. After sanding, I applied a dark walnut stain, letting it sit for 20 minutes and wiped it down. Two coats of marine varnish and this was the result....I think it's cool! I like the how the edges are darker....can't see from the pic so well but looks like a wood grain because of sanding the layers at abit of an angle. Fast fix...we'll see how it holds up. 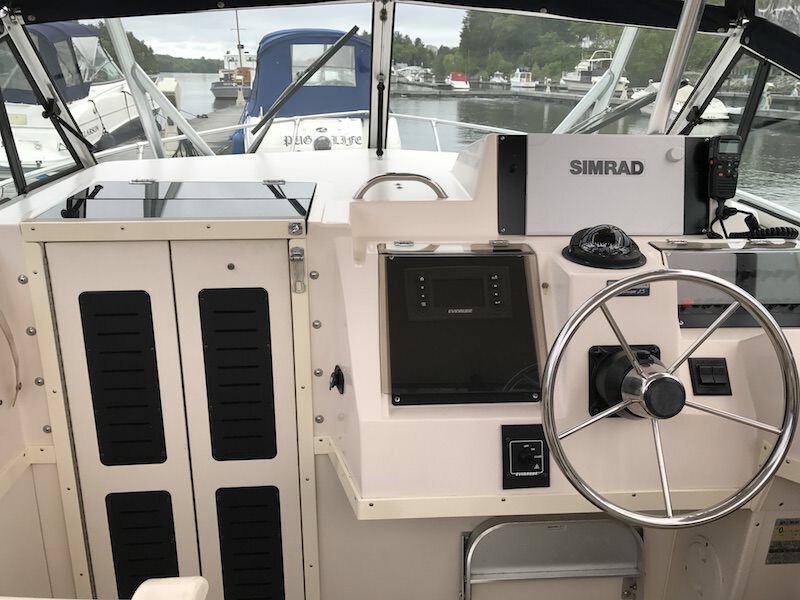 Here's a daylight shot....reworked trim very close to trim around the helm which was untouched as you can see next to helm seat. Cheap easy fix. 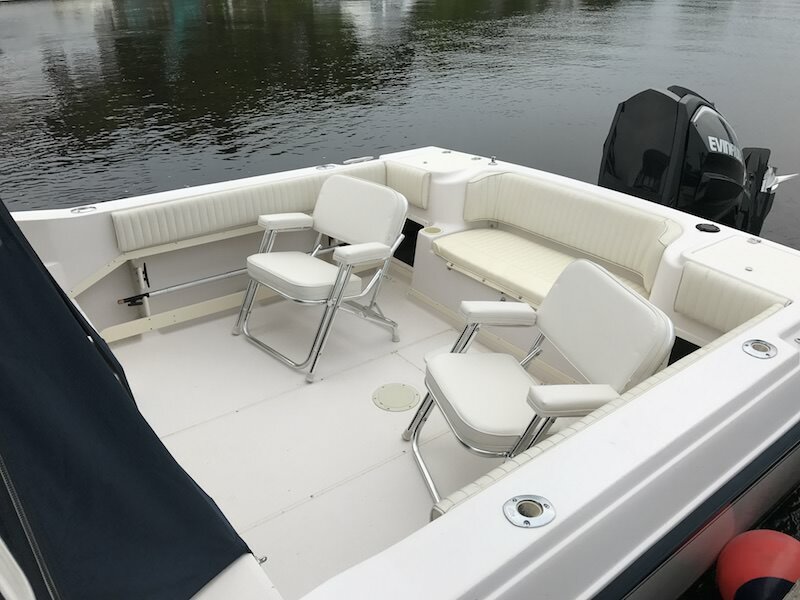 Did this as a winter project - went with TotalBoat single stage polyurethane, Hatteras White. I removed the trim, sanded and primed followed by two coats finish using the roll/tip method. When using long pieces of Starboard, you have to elongate the mounting holes and not fully snug down your fasteners to account for the expansion/contraction. Nice job on the trim, but it's your new motor that really makes her special! I didn't do anything under the hard top or around the helm...still in good shape. Sanding in place had to be tough. I added a coat of polyurathane over the top of the vanish for added durability. Post a pic of what you did...love to see. I might do anodized aluminum as a replacement or aluminum strips painted white . Ric, that looks great. I'm going to remember this post if I ever get around to doing something similar.